It may be misleading to speak about Native peoples as simply accepting or rejecting European religions. Everywhere, indigenous people interpreted Christian teachings and combined them with their own. They gave new meanings to ceremonies such as baptism and communion and to figures such as Jesus and the Virgin Mary. For many, traditional beliefs and practices remained an important source of resistance and identity. Is that a Christian cross at the center of the Pueblo bowl? When Native people integrated Christian ideas with their own, they often produced objects that combined traditional symbols such as kiva steps (shown on the front of the bowl) with Christian symbols such as the Latin cross. Native peoples everywhere in North America used cross designs, and the crossed line symbol in the center of the bowl pre-dates the Latin cross. Such crosses often represented the four cardinal directions-east, west, south and north, which have a spiritual meaning to many Native peoples. 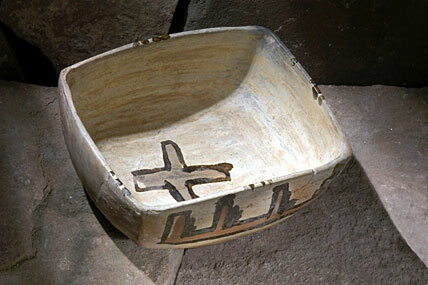 The kiva steps around the outside of this bowl may represent steps to the center of the Pueblo universe. The use of both these symbols as well as the material of the bowl (clay) indicate that this bowl had a spiritual meaning to the Pueblo children of Mother Clay.